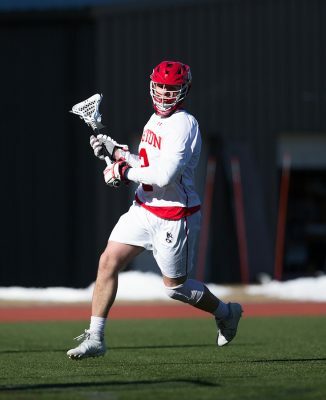 Despite falling to Harvard University 19-18 in overtime on Tuesday, the Boston University men’s lacrosse team’s offense found its groove and was backed by a five-goal performance from junior attack James Burr. The Hamilton native currently has 31 points and a team-leading 24 goals this season. The Daily Free Press caught up with Burr to talk about which celebrity he’d be for a day, his goals for the season and more. Who or what got you into lacrosse? My dad. He played in college at Harvard so he gave my brother and I sticks when we were like five. What is the BU locker room like before a game? It’s pretty rowdy. We have some particular songs we like to listen to so we kind of have a routine we go through every game day. Let’s say you’re stuck on a deserted island, which teammate would you bring? That’s a really tough question. I might bring [sophomore attack] Conor Muldoon because he would just keep me laughing the whole time. If you could have any job, no matter what your current skill level is now, what would it be? A professional DJ. Which game are you most looking forward to that’s still on the schedule? Just the upcoming one [at] Lafayette because it’s just another big Patriot League game. We’ve just got to win every single Patriot League game from here on out if we want to have a shot at the playoffs. So every game is the biggest one. Your older brother Elliot played at BU. Did that influence your decision to play here? Yeah, definitely. It was a huge part. I knew that we would have one year to play together. My freshman year was his senior year so just being able to play on the same field was awesome for me. It was just a great experience. Going off of that, what’s the biggest thing you learned from him? Work ethic. He was getting recruited when I was in like middle school so just seeing how hard he was working and what he did to get to the [Division I] level really showed me how to get there and how to work hard for it. Who would you say is your biggest supporter for lacrosse? Just my family as a whole. They literally come to all my games, and just having them on the sideline and to talk to afterwards is huge for me because they always come to my games — [in] middle school, high school and now. What is your favorite childhood memory of lacrosse? When I was in third grade, I got bumped up to play on my brother’s team when he was in like sixth or seventh grade so I got to play up with him. Then I would say equally with that is the first game of my freshman year. I got to play with him on the same field and he threw me a pass so it was pretty cool to be on the same field. Do you have any pre-game rituals or superstitions? I tape my stick before every game. Just a brand new tape job. That’s pretty much it. If you could be anyone for a day, who would you be? Tom Brady. If you could live anywhere in the world, where would you live? I would want to live somewhere warm, probably like California. You’ve come up big in last-minute and overtime games, how do you stay calm and focused in those moments? I just think of it as any other moment, you know. You just have to keep yourself calm. Our coaches do a good job of keeping us calm and letting us know that it’s just like a regular game except it ends when you score. Other than lacrosse, what other sports do you play? I loved playing football my whole life, but obviously can’t play in college. That was probably one of my favorite sports for my entire life. Then I love to ski, I love to golf, I love basketball. That’s pretty much it. Do you have any specific goals for yourself or the team this season? I want to win a Patriot League championship … That’s just always been our goal and it always will be. Do you feel like this will be the year to do it? I think we have a good shot. We’re definitely talented enough. It’s just a matter of playing well each and every week, and winning those Patriot League matchups. What do you think is the biggest misconception about lacrosse players? There’s definitely been some instances where lacrosse players get bad reps, but I would say that maybe that we don’t work hard enough. But just to go out in any Division I sport and any college sport in general, you’ve got to work hard every single day so we’re just like any other sport. You have a team-high 24 goals this season, what has gone into that off the field and during the off season? All last summer, I worked out every day really hard and shot a lot. I guess being able to play with our offense a little more this fall. I missed last fall so just getting a full fall and I haven’t missed a day all season so that’s really just helping me keep my rhythm up. What is your favorite part about playing under BU head coach Ryan Polley? I love coach’s passion. He knows a lot about the game and he definitely loves the game. Just being able to play for a guy that is that excited on game day really gets the energy going. Some responses have been shortened or edited for clarity.